The Stewards of the Chesapeake event was established in 2000 by the MAAGCS in order to develop a primary source of funding to support local research projects, support environmental efforts, and government relations as they pertain to the golf industry. MAAGCS members can invite their club or company representatives to participate for the preservation and improvement of both the game of golf and our environment. The tournament has raised over $100,000 since its inception, and proceeds benefit the MAAGCS BMP Project, Maryland Association of Green Industries (MAGI), various universities, the GCSAA and other groups supporting environmental issues, such as the Chesapeake Bay Foundation. In 2014 the proceeds were used to help fund the MAGI, which advocates on our behalf our industry with local, state and federal legislators. In 2015 designation of proceeds went towards the important Best Management Practices program that the association is preparing to launch. The association has partnered with the University of Maryland, the GCSAA, corporate partners, allied associations, our own members and others who support this important cause. The initiative was kicked off in 2014 with a donation from GCSAA’s Environmental Institute for Golf. Developing Best Management Practices for our specific area will ensure that we have a sustainable approach to and can continue providing environmental, economic and social benefits to golf and society. Your support of the Stewards of the Chesapeake event is a key element for our success. 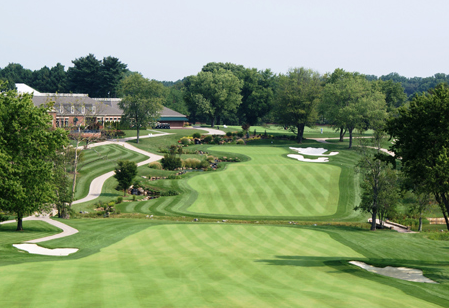 Located in the rolling countryside of Great Falls, Virginia, River Bend Golf and Country Club is one of the premier private membership clubs in the Washington, D.C. area. Known for many years for its challenging, beautifully maintained golf course, River Bend offers a full range of recreational and social amenities including golf, tennis, swimming, fitness & wellness, dining, catering, and event planning. A goal of the event is to showcase the environmental stewardship practiced by Maryland’s golf course superintendents to their staff members, general managers, club professionals, board members, committee chairs, legislators, turf professionals, industry suppliers, educators, students, government agency representatives and other interested parties. All proceeds will go directly to fund our BMP initiative. American Joe Miedusiewski served in the Maryland House of Delegates from 1975-1988, and in the State Senate from 1988-1995. He was a member of the Senate Economic and Environmental Affairs Committee, and Chair of the Alcohol Beverage Subcommittee. He created the Maryland Film Commission which moved Maryland from 50th to among the top 10 states in the nation in film production. The Maryland Film Commission generates tens of millions of dollars in economic activity annually. Senator Miedusiewski was a democratic candidate for Governor in Maryland's 1994 Primary Election. Joe hosted a weekly live radio talk show on WNAV 1430 AM, Annapolis, Maryland, during the legislative session and is now a guest commentator. He is a speaker, seminar leader, and trainer on state government lobbying to national and local clients. The event is open to all MAAGCS members and suppliers, their friends, colleagues (club professionals, GMs, board members) and associates at golf clubs in and around Maryland, Washington, DC, and Virginia. We encourage Maryland legislators to participate in this event, which gives promise to Maryland’s environmental stewardship. Clubs are encouraged to support this important cause by fielding a team. Format for the tournament is four-man Shamble. Each player drives and all players play from the selected spot. Two best balls net (80% handicap). USGA Rules govern play, as modified by Local Rules. Prizes will be awarded to the overall winners. Other prizes will be awarded for closest-to-the pin and longest drive.